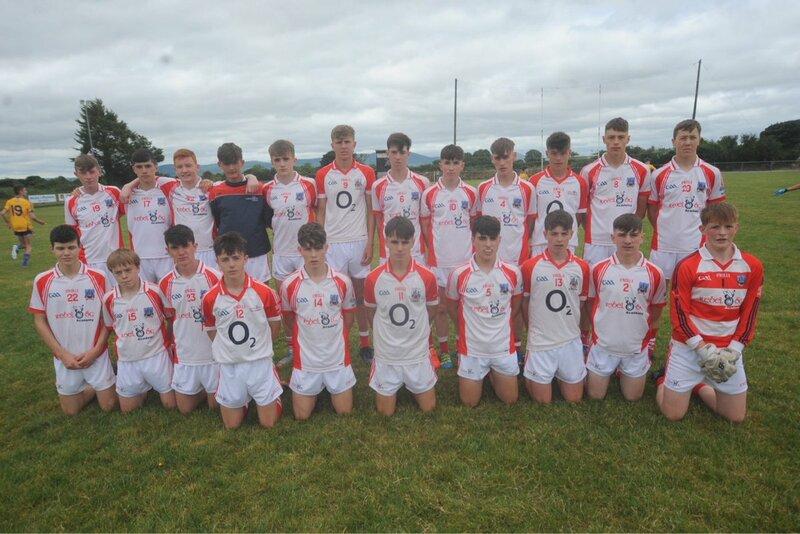 Some big games will take place in Rebel Og County U15 Championship this week. Below is all the details of the games involved. On Saturday 12th of May, Rebel Og are holding a Feile Skills competitions on Saturday 12th of May which will be hosted by Rebel Og Coaching. The venue for the event will be confirmed in the coming days. The County final section will take place on 19th of May. 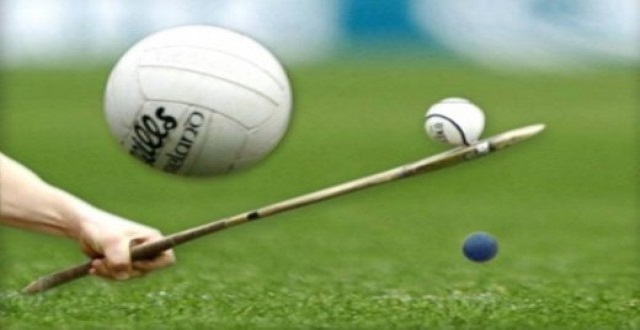 Attached below are information on the hurling skills and football skills. http://rebelog.ie/wp-content/uploads/2018/04/CoverMaker-1523006330431.jpg 1868 3320 Cian O Brien http://wordpress-1-1635781927.eu-west-1.elb.amazonaws.com/rebelog/wp-content/uploads/2016/12/logo_alternate.png Cian O Brien2018-04-29 10:52:022018-06-08 23:59:36Feile Skills Iomaint & Peil 2018. Rebel Og Chairman John Purcell presents the #CorkFeile18 title to @the_Barrs captain. 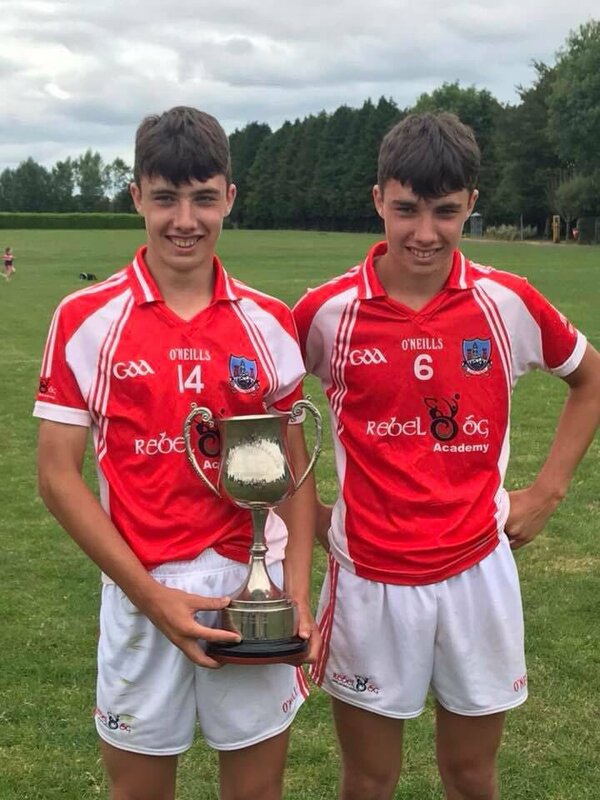 Corks’s Division 1 reps at National Feile for 2018 will be St.Finbarrs’ after their captured the ‘Dava O’Brien’ Feile hurling title after a one point win over Bride Rovers in the final on Friday night. Played in Togher in front of a big crowd, both teams put on a wonderful display of hurling as they battled it out for a place in National Feile . As the second half commenced, both teams up their effort and battle hard for the all important scores, the ‘Barrs one point lead at the break was once again the difference at full time when they ran out winners by a single score. Well done St. Finbarrs who will represent Cork at National Feile 2018 in Division 1. 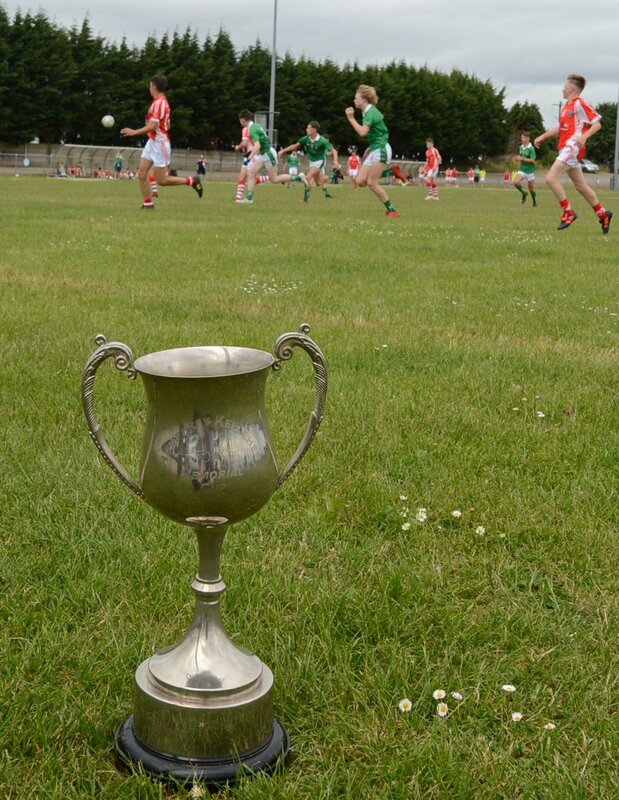 Across Cork GAA this weekend some big games took place. Sam Maguire’s win Minor A County Title. Bonfires will welcome Sam Maguire’s back to Sam Maguire Park on Sunday following their Clayton Sliversprings Minor A County success over Bantry Blues. This West Cork Derby brought hard, tight football from both sides but some well taken scores ensured that Sam Maguire’s would be County Champions. In Ballincollg, the final of Minor B1 hurling County championship tool place with Lisgoold beating Newcestown in the final by a goal. 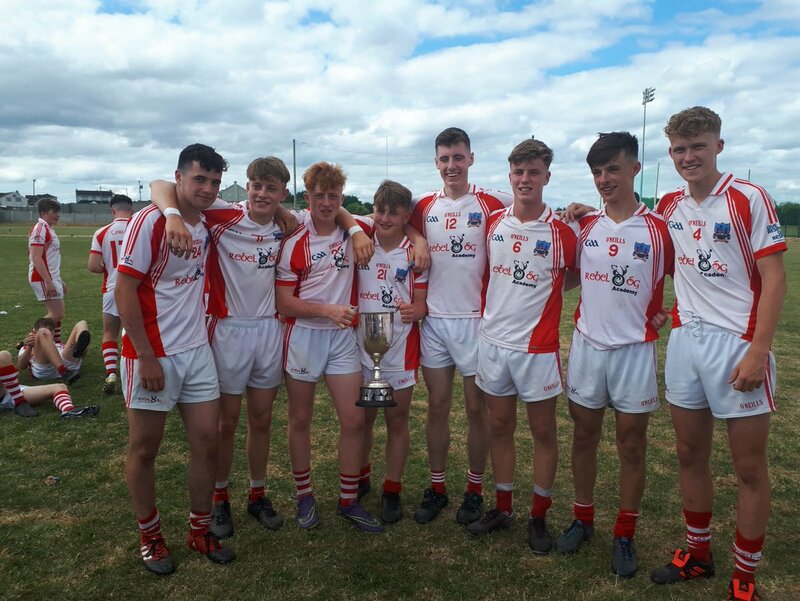 Douglas added the Premier U15 Football title to the U14 title that they have already won following their victory over Carriglaine. A game which had outstanding skill on display for both teams. Douglas scoring two goals at critical times insured that their name would be on the Cup. U14 double success for Ballinora this weekend when they over came a gallent Ibane Gaels team in the County Final. The Rebel Og East reps were too strong for the West Cork side on the decider. Some big games down for decision this weekend in Minor Championship. On the Saturday, the clash of St.Michaels against Carbery Rangers in the Premier 2 County Football championship will take place at 3:30pm in Carrigaline GAA. Below is the path to the final for both teams and details of the championship to date. Congratulations to the Cork Senior Camogie team on their All-Ireland success on Sunday in Croke Park. Cork who had one point to spare over rivals Kilkenny won their third title in four years. Cork reserved their best performance of the past 12 months to record an extraordinary victory over champions Kilkenny to move past Dublin on the roll of honour with 27 All-Ireland Senior Camogie Championships. Gemma O’Connor had flighted a soaring equaliser from 65m right on 60 minutes, having played the entire game despite being considered a major doubt with a knee injury beforehand. “It’s an unbelievable feeling” said White afterwards. “I’ve had a frustrating year in terms of injuries and so on, so I was delighted to have the option of getting on and getting a point. Ashling Thompson, Cork, and Julie Ann Malone, Kilkenny, collide at Croke Park. “It’s great, it’s absolutely fantastic” smiled the Inniscarra woman, talking about the victory rather than any personal achievement. “We came up here last year, we had high expectations, we were going for three-in-a-row and we were kind of taught a lesson by Kilkenny really. They played with huge aggression and they really knew how to score and how to break us down. “We had to work very hard, we went back early this year and we played Kilkenny in the League Final and felt we had a lot of work put in but that day they beat us as well. Cork were by far the superior team in the first half, but somehow only led by 0-5 to 0-2 at half time. They were in command in most sectors, with Orla Cronin proving a real handful for Anne Dalton, O’Connor looking comfortable and Ashling Thompson covering acres of ground while throwing herself into the physical battles with relish. Scorers for Cork: O Cronin 0-3, A O’Connor, O Cotter (2fs) 0-2 each, K Mackey, G O’Connor, J White 0-1 each. Scorers for Kilkenny: M Farrell, J A Malone, D Gaule (2fs) 0-2 each, K Power, S Farrell, M Walsh 0-1 each. CORK: A Murray, L Treacy, R Buckley, L Coppinger, G O’Connor, P Mackey, C Sigerson, E O’Sullivan, A Thompson, A O’Connor, O Cronin, O Cotter, H Looney, N McCarthy, K Mackey. Subs: L Homan for Looney (52), J White for Sigerson (60+1). KILKENNY: E Kavanagh, C Phelan, C Foley, G Walsh, A Dunphy, A Dalton, D Tobin, M Farrell, A Farrell, J A Malone, K Power, D Gaule, D Morrissey, M Walsh, S Farrell. Subs: M Quilty for Morrissey (HT), J Reddy for Malone (59).